Actually, I just finished this book. And I have to recommend it. It’s well worth your time and money. I love a good mystery. A good snarky voice is not a must while an excellent puzzle IS. I especially love a local well-drawn setting that is necessary to the story. Last October I purchased a first book by one of our classic mystery writers Christianna Brand. My mission for 2019 is to read the first outings by writers who became great. Brand authored two dozen mystery novels. I hope that reading the first outings by major writers will help me understand their career trajectory: how they launched themselves into the marketplace, what set them as distinct from other books in the marketplace, how they developed their puzzle. Soon I plan to read a later book for these successful writers, somewhere about 10 years into their career, to see how their writing and puzzle-making matured. I keep reminding myself that the other writers currently in the marketplace aren’t my only competition. I guarantee that my greater competition for longevity as a writer will be the writers with established names. So, in my search for mystery writers, I stumbled across Christianna Brand. 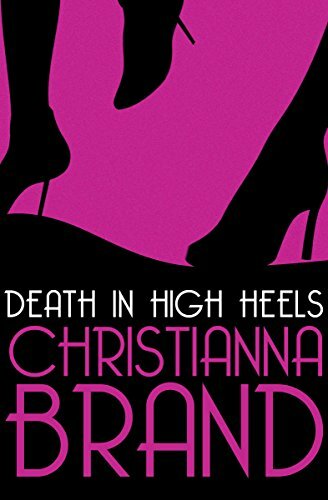 Death in High Heels was Brand’s first mystery, inspired by an irritating co-worker that she dreamed about killing. No lie! It’s in the biography. I didn’t get to this book until New Year’s, and I’ve just finished it. And I was surprised–pleasantly so. Why? Well, for a book that was dreamed up as a fantasy about killing a co-worker, it was hilarious! The puzzle was even better. For most mysteries, I can figure out the puzzle before the first third of the book is complete. I figured out this one, too, but I kept reading for the snarky voice of the protagonist. Then Brand cleverly re-wrapped the puzzle before she unraveled it all over again. Surprised me! Here it is: Death in High Heels, well worth the $7.99 price tag. Enjoy! While the link takes you to Amazon, I don’t receive any monies or anything else from my recommendations. I never do. I’m just recommending what I enjoy. Someday I might recommend against purchasing a product. Not yet, though.